About the Book: As "Love Me Tender" plays in the background, Debbie Carmichael determines to salvage her family's restaurant, Sweet Sal's Soda Shoppe, when her father's health fails. Teen heartthrob Bobby Conrad agrees to perform at a fundraiser concert. But just two weeks before the highly publicized event, Bobby backs out of the benefit. Enter Johnny Hartman, a young, unknown singer to take Conrad's place. Debbie soon realizes the twists and turns leading up to the concert are divinely orchestrated. And it isn't dreamy Bobby Conrad who has stolen her heart - but the tender love of Johnny Hartman. About the Book: Lancaster County, with its rolling meadows and secret byways, may seem idyllic, but it is not without its thorns. THE ROSE TRILOGY is the stirring saga of two Amish sisters on the fringes of the church, and the unforeseen discoveries that change their lives. Rose Kauffman, a spirited young woman, has a close friendship with the bishop's foster son. Nick dresses Plain and works hard but stirs up plenty of trouble too. Rose's sister cautions her against becoming too involved, but Rose is being courted by a good, Amish fellow, so dismisses the warnings. Meanwhile, Rose keeps house for an English widower but is startled when he forbids her to ever go upstairs. What is the man hiding? Rose's older sister, Hen, knows more than she should about falling for the wrong man. Unable to abandon her Amish ways, Hen is soon separated from her very modern husband. Mattie, their young daughter, must visit her father regularly, but Hen demands she wear Amish attire--and speak Pennsylvania Dutch, despite her husband's wishes. Will Hen be able to reestablish her place among the People she abandoned? And will she be able to convince Rose to steer clear of rogue neighbor Nick? 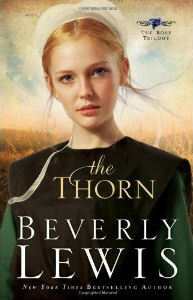 I hope to dig into The Thorn soon, I've always enjoyed Beverly Lewis's Amish books. I received both of these books from the publisher.